The two companies with the most data right now, according to an article in The Verge, are Waymo and Tesla. Waymo, funded by parent company Google, uses a more high-tech approach to development by using LIDAR and simulated driving. LIDAR “is a lot like radar, but instead of radio waves, it sends out millions of laser light signals per second and measures how long it takes for them to bounce back.” This gives the cars the ability to collect more data on their surroundings and have greater precision in the dark. The company has racked up 5 million miles of street driving and is near 6 billion miles of simulated driving. Waymo is also conducting tests with self-driving trucks in California and Arizona as well. Tesla’s self-driving technology relies on cameras, sensors, and radar instead of LIDAR. While this approach is less expensive and bulky, the trade-off is in accuracy. Since Tesla collects data from all of their vehicles, they have over 300,000 vehicles on the road around the world to learn from, in contrast to the several hundred owned by Waymo, and their cars navigate more diverse settings. Uber reached the 2 million mile mark for self-driving in November 2017, but has faced some serious setbacks. 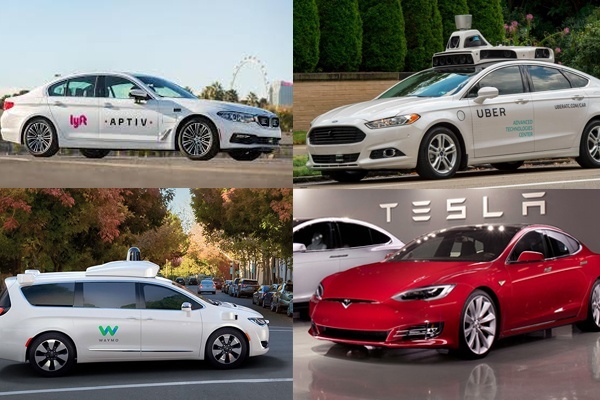 The first was the lawsuit from Waymo which was recently settled for a quarter of a million (a success in their eyes) and the second was the crash involving a pedestrian in Arizona this March. The CEO has shared that the company remains committed to moving forward with self-driving cars even though testing is on hold for now. Uber is also the parent company of Otto which has a small fleet of self-driving trucks operating in Arizona and will continue to advance its truck driving technology. In a recent shift, Lyft is also designing self-driving vehicles with its own in-house engineering team rather than relying on partners with more advanced technology. It recently opened a 50,000-square-foot facility in Palo Alto for its engineering team, led by Luc Vincent from Google Maps, and began testing its autonomous vehicles in California. Autonomous driving could be one of the biggest game changers in the logistics industry since the shortage of qualified truck drivers is pushing rates higher and shows no sign of easing. TranzAct will continue to provide updates along the way. For the time being, the best bet for most shippers is to optimize the lanes they use. If you’re interested in evaluating your LTL and truckload spend to see if there’s an opportunity for improving your carrier alignment, we encourage you to get in touch to benchmark your rates.